Many processes throughout the Process Industry have an essential requirement for clean dry air to ensure their safe, efficient and profitable operation. The problem with air is that it contains water vapour, which condenses to water droplets when the air cools. Water and dirt in compressed air is a major problem as it may damage the equipment being supplied by the compressor and contaminate the process that equipment supplies. 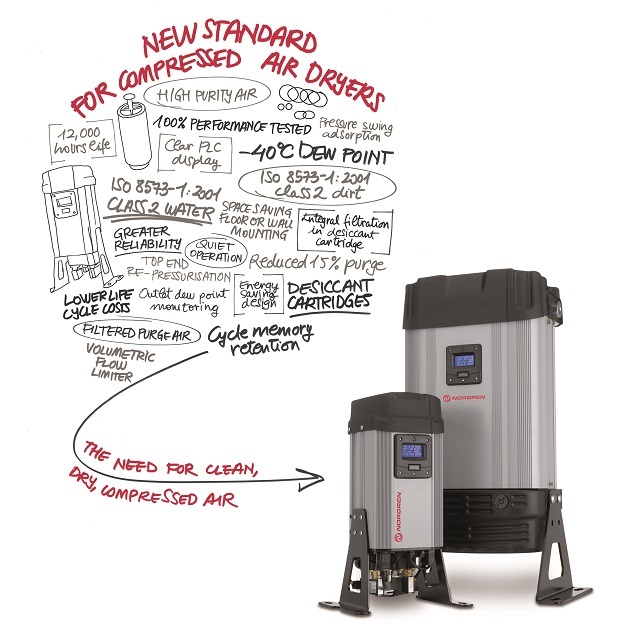 The Norgren Hydra-D range is a new standard for compressed air dryers incorporating innovative features and benefits. How does this innovative desiccant dryer for compressed air applications work? Hydra-D dryers use the pressure swing adsorption principle to efficiently dry compressed air. The desiccant dryers use a heatless twin tower configuration housed in a modular design. Each column contains a unique desiccant cartridge which incorporates inlet and outlet filtration. Wet air from the compressor after-cooler enters the dryer and is directed into column A. Bulk liquids and particles are removed by the filtration/separation stage, which is located on the inlet to the cartridge. Water is retained within the dryer until the column is regenerated, when it will be vented to atmosphere as it is depressurised. Following the filtration stage, air passes through the desiccant bed where any remaining moisture is adsorbed. Finally, the dry air passes through a particle filter, which retains any remaining desiccant particles that may have been carried through the system. Simultaneously, a small amount of dry air is counterflowed down through cartridge B and exhausted to atmosphere, removing the moisture and regenerating the desiccant. The dryer is controlled by a PLC which periodically switches the solenoid valves when the compressor is running, reversing the function of each column and therefore ensuring the continuous supply of dry air. Guaranteed Performance - Norgren’s Hydra-D delivers the highest standards of purity, all units are 100% leak, function and performance tested. Reliability - High efficiency water separation with condensate vented every cycle, Integral volumetric flow limiter prevents overflow, eliminating moisture and loss of dew point and the cartridge outlet filters prevent dust contamination of purge air. Quiet Operation - Exhaust air channelling gives significantly reduced noise levels. Control and Display - Clear PLC display provides full operational and monitoring data. Energy Saving Design - Integrated inlet and outlet filtration reduces pressure drop, purge air for regeneration is only 15% and dew point monitoring can save up to 60%. Simple Installation - Compact space saving design. Easy To Maintain - 12,000 hour servicing, No special tools are required, no external filters or silencers to service and no handling of loose desiccant. Norgren’s world-class portfolio of fluid and motion control products and technologies, coupled with extensive sector knowledge and technical excellence delivers an unrivalled proposition to Norgren customers.